The saga continues with blocks 28-31 of the City Sampler from Tula Pink's book 100 Modern Quilt Blocks. Kristina has combined more interesting prints from her scrap bag (box/bin/room). The theme of rectangles is present here. So many combinations and arrangements of the simple rectangle! One thing you see as we go through these blocks is that they are not highly complicated, but take some planning to get colors where you like them best. The good news is that even if you end up with a color in a less desirable location, either you can let it be because there are so many blocks to look at, or you can do it over because it's just one block, not a whole quilt! 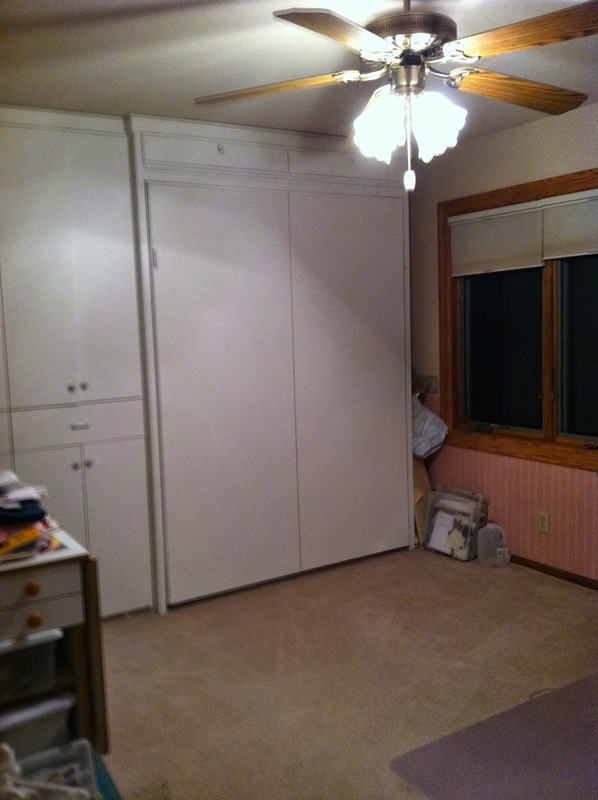 And onward with our tour of sewing rooms! Thank you, Jeanne, for these pictures. Only 1 thing missing--sewing machines! Have you converted to hand work only? I think not. Jeanne works in our Bernina Sewing Center and teaches classes, both for the Sew Center on the machines, and for the Quilt Shop on quilts and techniques. That's Jeanne, below, on the left, getting ready to demonstrate machines at the Minnesota Quilters' Show a year ago (or maybe 2). And wouldn't you know, there's Carrie in the pinkish shirt doing a photo bomb! She shows up everywhere! And in the picture on the right, Jeanne is at one of our retreats and using the Bernina software on her laptop to give directions to her machine. 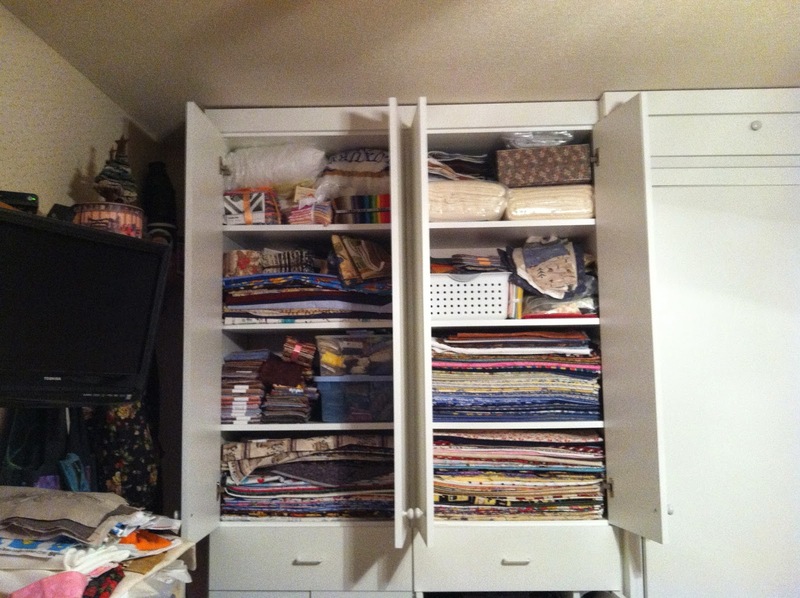 Jeanne's sewing area does double duty as a guest room, and the last time she had to clean it up for guests she snapped these pictures. 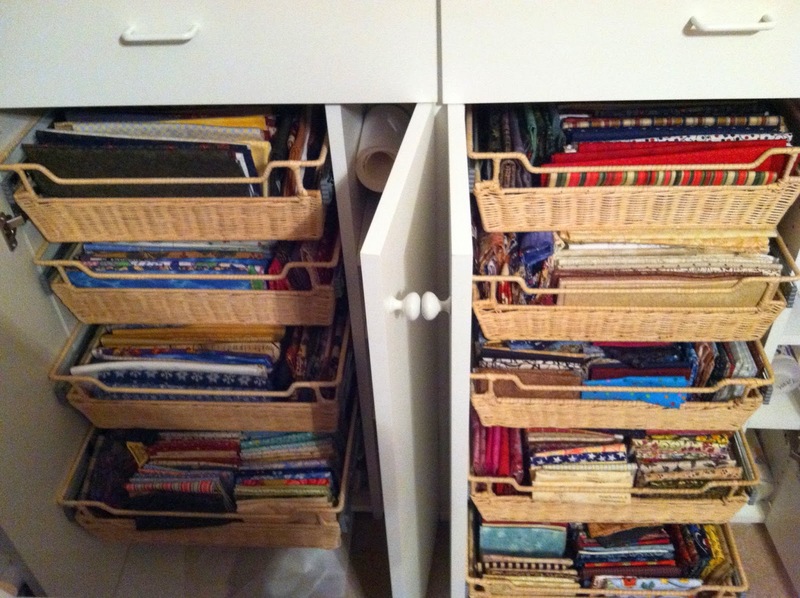 Shelving units full of organized fabrics and projects. And the cabinet on the far right is a Murphy bed. The slide-out baskets hold a lot of stuff and nothing gets lost in the back of the shelf. Something tells me there's a machine (or 2 or 3) in there somewhere, and I think Jeanne owes us a couple more pictures, right? Jeanne helps facilitate our store machine embroidery retreats (read about them here and here)and does a fantastic job of answering 20 questions all at once. She has been a godsend to me as I learn about machine embroidery, always patient with my questions and never making me feel like an idiot! That's a special talent. 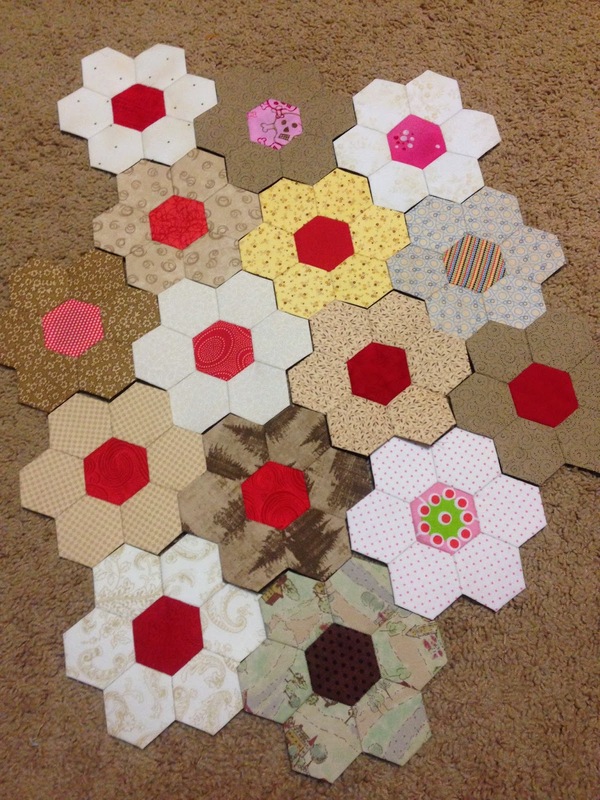 With the traditional little hexagon templates, she has been making these "flower" blocks. This is the basis for the traditional Grandmother's Flower Garden quilt. I am not sure, but I think that Kristina's pieces are the 1" size, meaning that each of the straight sides of the individual hexagon measures 1". Sometimes she works with smaller sizes. A more whimsical color palette. And her little storage box with neatly filed little hexies ready to go. of conveniently pre-cut diamonds and papers. There is a picture visible of the quilt pattern underneath. a great scrap quilt that is a log cabin variation, random strip widths added to reach the size that Kristina has chosen. Bright and colorful! I love the idea of making the log cabin variation with scraps.